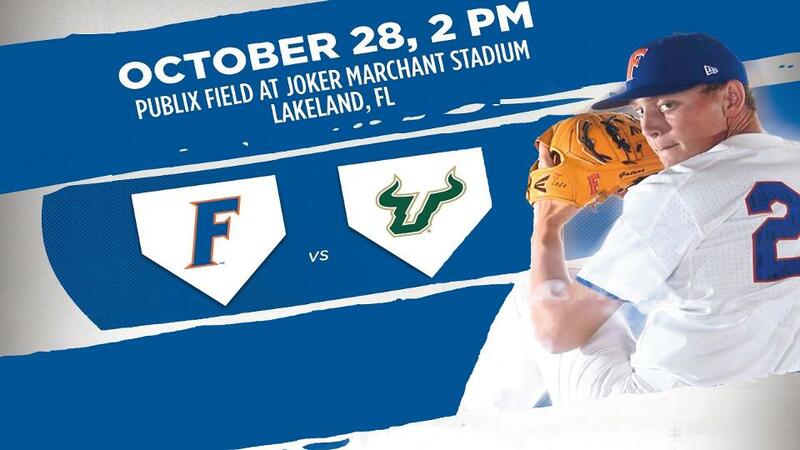 Lakeland, Fla. - Publix Field at Joker Marchant Stadium will play host to the University of Florida and University of South Florida baseball teams in an exhibition game on Sunday, Oct. 28, at 2:00 p.m. The game was made possible by a recent NCAA rule change that allows Division I collegiate baseball teams permission to play two exhibition games during the non-championship segment of the season. The 2017 National Champion Florida Gators were the No. 1 ranked team in the country for most of the 2018 season, earning their fourth consecutive trip to the College World Series and finishing the season with a 49-21 record. The Bulls, nationally ranked in the top 25 for part of the 2018 season, finished the season with a 36-22-1 record. Tickets for the game may be purchased online at www.lakelandflyingtigers.com or by calling the BayCare box office at (863) 413-4140. Tickets may also be purchased in person at the BayCare box office Mon-Fri 10 a.m. - 5 p.m. Groups of 20 or more may contact our group sales department at (863) 413-4115. The Florida Gators will play as the home team and occupy the 3rd base dugout. The USF Bulls will occupy the 1st base dugout. For more information, please contact the BayCare box office at (863) 413-4140.